I decided to review three sets I received from MIG Productions in one article, as they are quite similar in one aspect - all contain resin parts, which can become a base or major element for a 1/72 scale diorama. The first set contains two sections of railroad track and other two sets contain pieces of cobblestone street. The latter can be used as complete diorama bases for figures and / or a small 1/72 vehicle, but can also be combined with more similar street sections and other elements to create larger diorama. 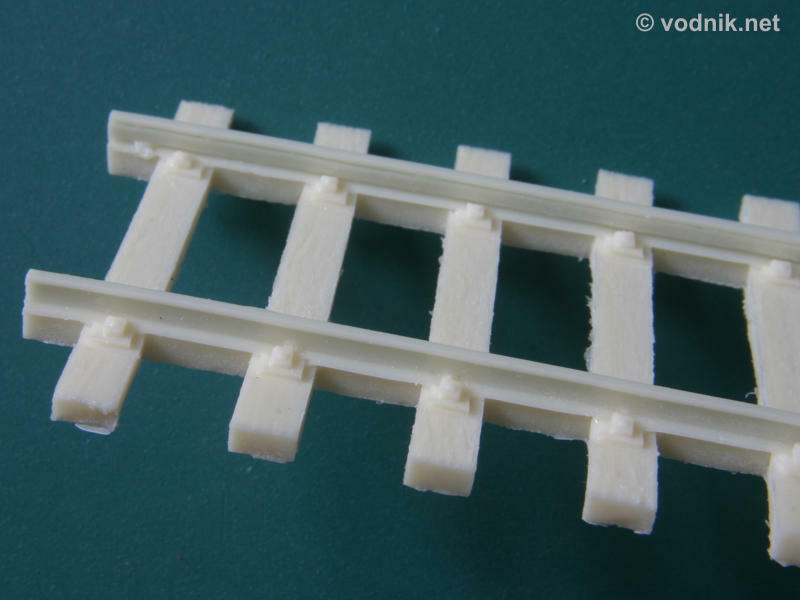 Railroad tracks require some additional base to be made by modeler, as the set only contains rails on ties. Each set is packed in a small plastic zip-bag with a thick paper cover flap stapled to it. No instructions are provided other than picture of painted contents of the set, but they are not really needed. Set MP 72-084 contains two railroad track sections. The gauge of tracks is slightly below 20 mm, what in 1:1 scale translates into accurate dimension for European/American standard track (4' 8.5"). Some details of two included track sections reveal that both are copies of the same master, but interestingly they differ slightly in length with one section being 122.5 mm and the other 124 mm long. The sections fit very well to each other, so can easily be used to create a longer railroad segment. Between each pair of ties and under each rail there is a block of resin - like vertical extension of the rail, which some modelers may wish to remove to get more accurate tracks, but if you decide to leave it as it is it can easily be hidden under embankment gravel and can be made invisible on a finished diorama. Cross-section of rails looks accurate and there is a nice wood texture on ties surface. Sets MP 72-085 and MP 72-086 are almost identical - both contain a rectangular (74 mm x 112 mm) section of cobblestone street. The only difference is that in the set 72-085 we get a cobblestone in good condition, while the part included in set 72-086 has several holes in it with a big crater in the middle. It is described as a bomb crater on the box, but it looks too shallow to represent aerial bomb crater - more likely a artillery shell or mortar grenade one. 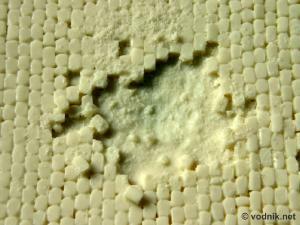 There are some "loose" cobbles molded around the crater, but a few more should be added for more realistic effect. 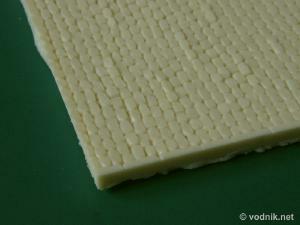 Street sections in both sets are about 5 mm thick. As I mentioned above each of the street sections can be used as a complete base for a small diorama, but they can also be combined to build larger street section. Close-up of railroad tracks. Note excess resin under each rail. In set 72-085 cobblestone street is in quite good condition. Click on picture to enlarge it. While in set 72-086 there is a large crater in the street..
Three sets from MIG Productions can make the life of diorama builders easier. 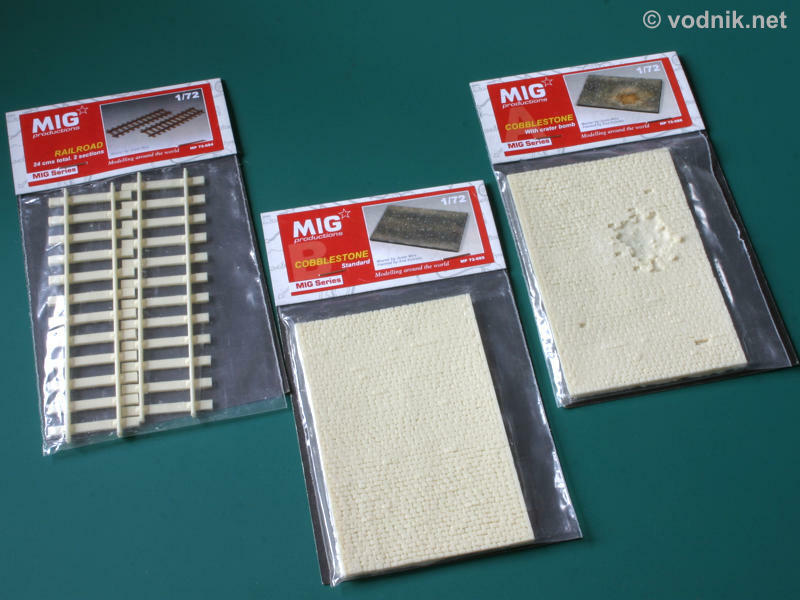 Skilled modeler should be able to scratch build cobblestone sections or even railroad tracks quite easily, but using those high quality products from MIG can save a lot of time, which can be used to perfect other parts of diorama. Recommended!